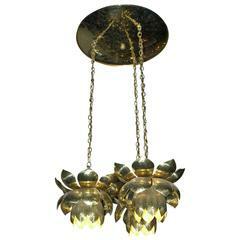 This is the large version of the Feldman Lighting Company's brass lotus chandelier, original brass patina. Three small sockets at top. The lower light uses 1 - 60 watt max "A" base bulb and the upper lights use 3 - 40 watt max candelabra base bulbs. Can be professional polished for $295 and will take up to 3 weeks. Retains label. Hollywood Regency at its best. Please see my other listing for the smaller version. Original condition, see description for more info. Can be polished for $295. 1970s brass Hollywood Regency mastercraft octagonal mirror with 3/4 bevel edge. Glass is in excellent condition, brass has nice applied patina from Mastercraft. Very heavy! Label. Mid-Century, Hollywood Regency, brass, pendant chandelier by Feldman Lighting Co., is a cluster of three lotus flowers hanging from a wide canopy.